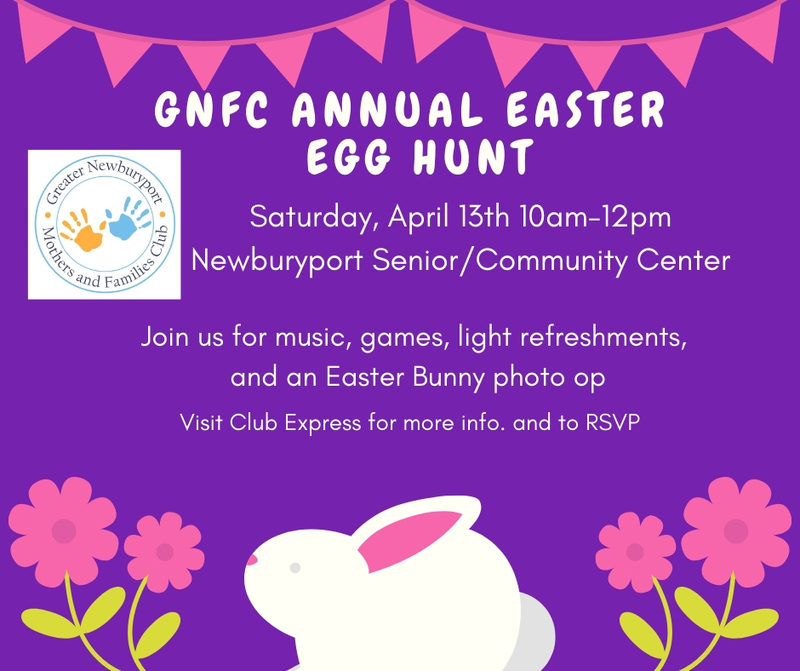 Hop on over to Newburyport’s Senior/Community Center for the GNFC’s Annual Easter Egg Hunt! Please join us between 10am - 12pm for music, crafting, games with prizes, and the chance to get your picture taken with the Easter Bunny. Coffee and light refreshments will be served. The egg hunt will start promptly at 10:45 am. Please bring your own basket/bag for the hunt. Young children will have a head start before the "big kids" join the fun. Advance registration is required. Member children are $5 each and must be added to your Club Express account in order to successfully register. Adults and children under 1 are free. Sorry no refunds. We would like to say a HUGE thank you to Iron Tree Service for its generous donation of 500 eggs plus 2 special prize eggs containing $250 Iron Tree gift cards for our hunt! Registration and games will be inside the Senior/Community Center, but the egg hunt will be outside. Dress accordingly! Don’t forget your camera for photos with the Easter Bunny! Thank you to our sponsors. We are grateful for your continued support!